Information on Frostytech's test methodology is available here. 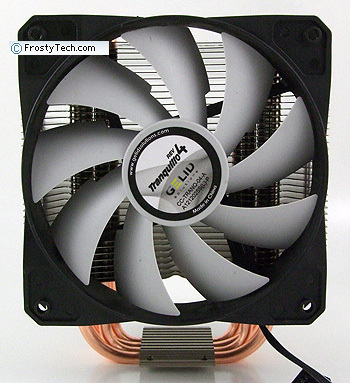 Gelid's Tranquillo 4 heatsink ships with a 120mm PWM fan that draws power from a standard 4-pin fan header. 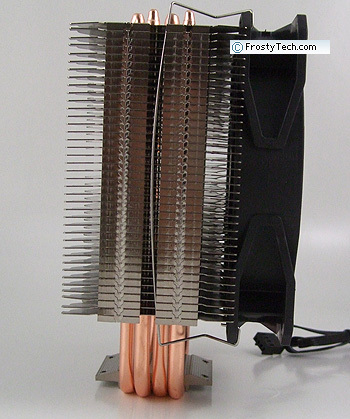 The 152mm tall heatsink employs four 6mm diameter copper heatpipes which rise up through a 100mm tall aluminum fin stack. The aluminum fins measure 0.4mm thick and are spaced 2.0mm apart. 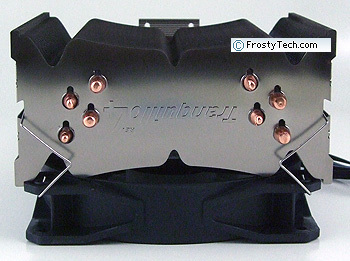 The bottom-most fin is elevated 42mm above the socket for motherboard component clearance. The wire fan clips lack thumb holds so the entire heatsink measures just 128mm wide. 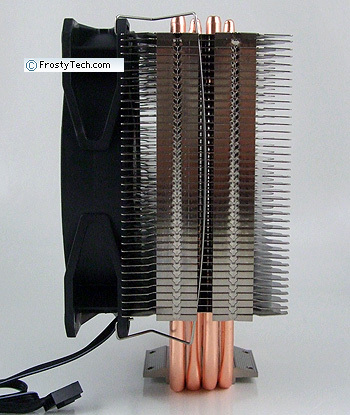 Heat pipes are soldered to the copper base plate and to the nickel plated aluminum fins. The heatpipes are generally positioned in the path of highest airflow from the fan, so the maximum amount of heat energy is conducted to the region of aluminum fins which receives the most airflow. 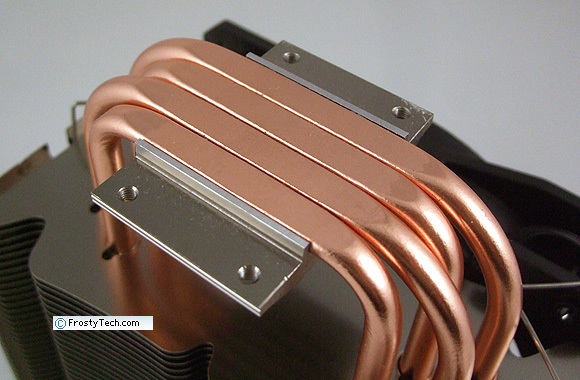 The area of the exposed copper heatpipes on the base of the Gelid Tranquillo 4 heatsink measures 39x30mm in size. The extruded aluminum cap on top is 8mm thick. Flipping a heatsink over to inspect the business end is often a simple indicator of overall cooler quality. More practically speaking, a heatsink is in many ways only as effective as the contact it makes with the processor - the flatter and smoother the better. 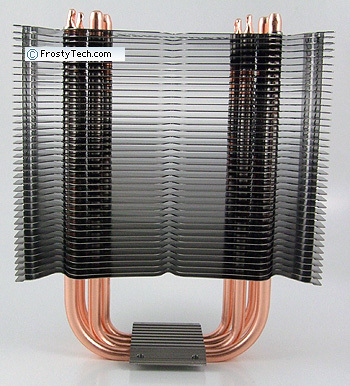 Base finish is one of the criteria that Frostytech measure in the course of evaluating heatsinks, and it involves two distinct aspects. Surface Finish is the first; this is calculated with the aid of Surface Roughness Comparator that has a cross section of common machine surface finishes and their numerical surface roughness equivalents in microinches. The second is Surface Flatness. This is tested with an engineer's straight edge or proven flat surface, in two axes. 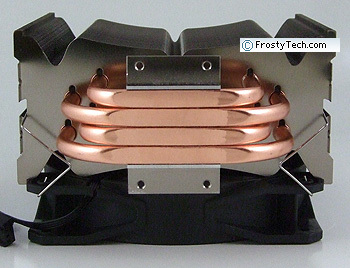 Gelid's Tranquillo 4 heatsink employs an exposed heatpipe base which has been machined flat. Base flatness is excellent in both axes. The machined finish is very slightly ridged, surface roughness is at or better than ~32 microinches.